Package Content : 30 soft contact lenses in sterile buffered saline solution containing PEG and HPMC. 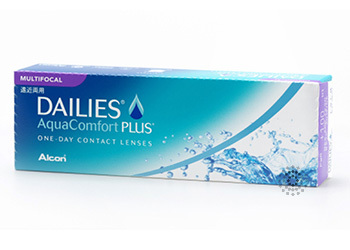 Dailies® AquaComfort Plus® Multifocal 30 Pack contact lenses introduce a triple action moisture system to presbyopic wearers who wish to continue enjoying wearing contact lenses. Included in this system is a proven cushioning lubricant that provides instant comfort at the start of the day, and a hydrophilic (water-loving) wetting agent that works to provide moisture throughout the day when combined with the blink-activated moisturizing agent that guarantees end-of-day comfort. Another one of the newest product extensions to the well-established and highly successful Dailies® AquaComfort Plus® family of lenses, the Dailies® AquaComfort Plus® Multifocal 30 Pack lens is designed for wear as a daily disposable. This means you take the lenses out each night and replace them with fresh lenses each morning. Be sure to follow your prescribing eye care provider’s recommended replacement schedule. TheDailies® AquaComfort Plus® Multifocal lenses are tinted for ease of handling, but will not change the color of your eye. The tint is simply designed to facilitate locating the contact lenses in solution.